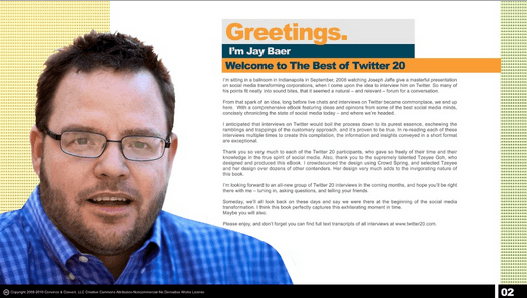 I’m very proud to launch my new ebook that chronicles the best moments from my Twitter 20 series of live interviews on Twitter. You can download it free below. AND, you can win a hard copy (only 50 exist) FedExed to you. Just Retweet this post, and 5 retweeters will be randomly selected this Saturday and will win a copy. I’m sitting in a ballroom in Indianapolis in September, 2008 watching Joseph Jaffe give a masterful presentation on social media transforming corporations, when I come upon the idea to interview him on Twitter. So many of his points fit neatly into sound bites, that it seemed a natural – and relevant – forum for a conversation. From that spark of an idea, long before live chats and interviews on Twitter became commonplace, we end up here. With a comprehensive eBook featuring ideas and opinions from some of the best social media minds, concisely chronicling the state of social media today – and where we’re headed. I anticipated that interviews on Twitter would boil the process down to its purest essence, eschewing the ramblings and trappings of the customary approach, and it’s proven to be true. In re-reading each of these interviews multiple times to create this compilation, the information and insights conveyed in a short format are exceptional. Thank you so very much to each of the Twitter 20 participants, who gave so freely of their time and their knowledge in the true spirit of social media. Also, thank you to the supremely talented Tzeyee Goh, who designed this eBook. I crowdsourced the design using Crowd Spring, and selected Tzeyee and her design over dozens of other contenders. Her design very much adds to the invigorating nature of this book. I’m looking forward to an all-new group of Twitter 20 interviews in the coming months, and hope you’ll be right there with me – tuning in, asking questions, and telling your friends. Someday, we’ll all look back on these days and say we were there at the beginning of the social media transformation. I think this book perfectly captures this exhilarating moment in time. Maybe you will also. Thanks to everyone who tunes in Twitter 20 via Twitter, and special, gigantic hugs of appreciation to all of the social media geniuses who have participated – your brilliance inspires and motivates me every day.